The Buxton Inn is located in the quaint town of Granville in Ohio. This particular structure is said to host some of the “friendliest” hauntings in the entire state! In the year of 1812, a man who was a pioneer and named “Orrin Granger” had previously purchased a small section of land in the area and constructed what was known in those days as “The Tavern”. Typical of the architecture popular in the early American days, the structure had a court for stage coaches, an exquisite ballroom for social events, and various other amenities to suit the needs and desires of the societal elite of the time. Interestingly, this structure also served as the very first post office in the area. Orrin passed away just six years later, but it is said that his spirit remains despite ownership was changed several times. Here, you will learn about the haunted history of the Buxton Inn in Ohio. In the year of 1829, the son of the man that owned the structure experienced what is believed to be the first paranormal experience associated with the Inn. The young man’s name was Fred Sweet. Innocently, he went downstairs after bedtime in order to locate something to snack on. Unfortunately, he did not appear to make it in time. To his surprise, he stumbled upon a misty male figure in the kitchen having a snack too. It is said that the young man and spirit interacted and the spirit informed him that he was Orrin, the initial owner. It is expressed that the spirit released a wide array of information pertaining to his time period which would later be verified by the skeptical individuals. Furthermore, it is said that the spirit of Orrin expressed his satisfaction in the operation of the establishment, with a smile – then, he simply left. The Buxton Inn also houses a ghost that was a real actress and performed through singing in life. Her name was Ethel Bounell. In the year of 1934 she established ownership of the structure and remained the owner of the hotel until the year of 1961. Apparently, this lady passed away, yet her spirit remained in the structure and became known to those that experienced her as the “Lady in Blue”. In life, she absolutely adored the color blue. In the afterlife, she sported beautiful blue dresses that definitely complimented her overall appearance and made those that experienced her a bit more calm in the midst of a highly unusual situation. The Buxton Hotel guests, keepers, and others attached to the structure have observed this spirit opening windows, moving items, and simply strolling in and around the building. When it comes to hauntings, we often think of men and women wandering in the afterlife seeking spiritual release – very few times do we consider animals as spirits. However, the Buxton Inn apparently has their very own ghost cat! Several ghost and employees at the structure have stated that they have observed a cat lingering throughout the various rooms of the inn, resting in various locations throughout the building, and even playfully prancing around those visiting the Inn! Several paranormal investigations have been conducted at the Buxton Inn and several pieces of documenting evidence indicate that there is activity at this particular location. There are several witnesses that have experienced the hauntings mentioned above, as well as other unusual situations. Shadows and whispers are often experienced in the dark corners of the inn, particularly in the basement area. What appears to be the apparition of Major Buxton himself is rumored to have made an appearance in the Buxton Inn. If you are interested in ghost hunting, and would like to experience these hauntings for yourself, plan a visit to the famous Buxton Inn. You are sure to be delighted with the encounters and experiences that you find yourself engaged in on your stay! 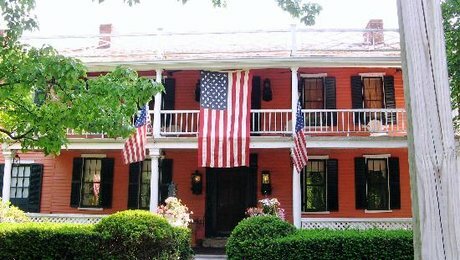 Get directions, view photos and read the visitor reviews and traveler tips for the Buxton Inn.